Explanation: It's been a long trip for the Martian rover Opportunity. Last week Opportunity surpassed Viking 1 as the longest running mission on Mars, now extending well over six years. 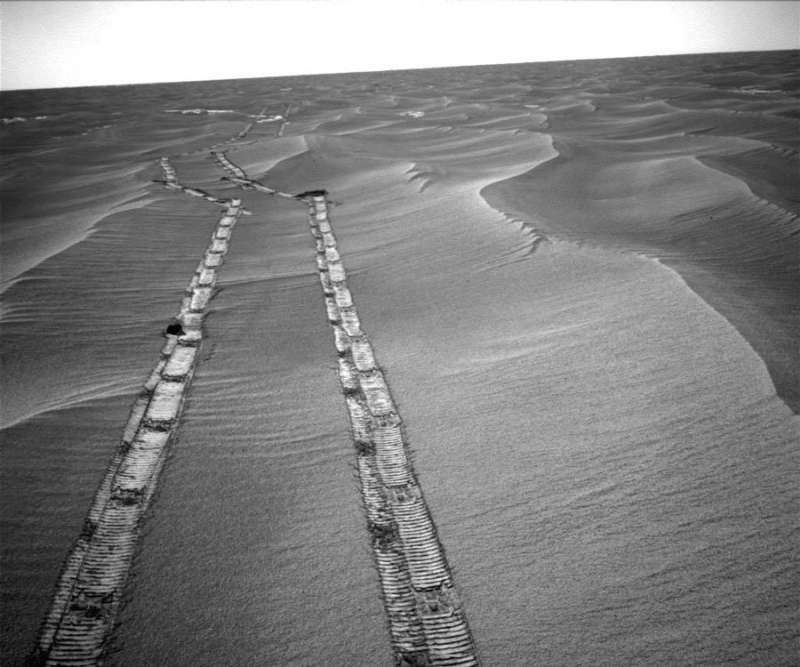 Pictured above, Opportunity's tire tracks cross a nearly featureless Martian desert, emanating from a distant horizon. Landing in 2004 in Meridiani Planum, the robotic Opportunity has embarked on its longest and most dangerous trek yet, now aiming to reach large Endeavor Crater sometime next year. Endeavor, it is hoped, holds new clues to the ancient geology of Mars and whether Mars could once have harbored life.